The April meeting of the Friends of Indian River was this past Thursday at our new meeting location at the Oaklette United Methodist Church on Indian River Road. We introduced two newly formed committees - the Outreach and the Planning Committees. The Planning Committee will be meeting to build and prioritize a list of possible projects for the group to undertake. The Outreach Committee will take the lead on spreading the word about the group. They have prepared a draft flier for advertisement. Along with this flier is a preliminary calendar of events highlighting presentation topics and other events for the rest of this year. Our presentation for the evening was a virtual tour of the Indian River watershed using Google Earth. 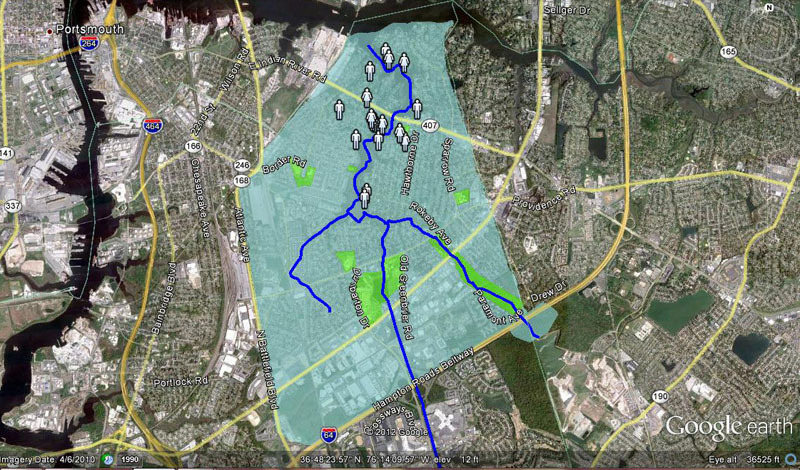 We "flew" in from orbit to the Elizabeth River watershed and then zoomed in to our community, highlighting the parks and public spaces. Then we flew along all the tributaries of the Indian River getting a close look at the shorelines, marshes, homes and businesses of the area. Members shared some of their stories about various events on the river. We also discussed the desirability of No Wake signs in the river. We had a very enthusiastic crowd at our second meeting this past Wednesday. By the end of the meeting we had identified several possible committees to focus on different tasks and started filling up our calendar for the year with numerous events including doing an Indian River Road Cleanup on April 28, Clean the Bay Day on June 2, and potentially setting up a booth at the Indian River Craft Show in November. Our next meeting will be at the Oaklette United Methodist Church on Thursday, April 12th. The primary goal of the Friends of Indian River is to improve the quality of life for all the residents of the Indian River neighborhoods by promoting and preserving a healthy and clean river, shorelines, parks, and green spaces connected to the surrounding community. These efforts include outreach to the community promoting attractive streetscapes, encouraging sustainable gardening and landscaping methods, energizing local business development, and supporting broader civic activities to improve the community. Next we discussed the Indian River Shopping Center and heard about the info received at the previous Norfolk Highlands Civic League meeting. Concerns were raised and ideas were shared. In the end it was obvious that a multi-pronged approach was necessary : working with City planners, identifying potential tenants, and sprucing up the neighborhood. Later in the meeting we agreed to establish a 'Joint Action Committee' with Norfolk Highlands Civic League to focus on Indian River Road. We then discussed what activities the group should undertake. Ideas flowed quickly and from every direction. One of the first observations was that actions of the City Council have significant bearing on the community and it is important for each citizen to make informed choices when voting for City Council. Elections are coming up on May 1st and we'll be voting for three open seats on the City Council. The Norfolk Highlands Civic League has invited all the candidates to come talk at their next meeting on April 5th; all are welcome to attend. Outreach to the broader community was a lively topic. Several members were ready to talk to their neighbors and pass out fliers. There was a recommendation to put some structure upon these efforts and we agreed to form an Outreach Committee and several members put their name on the list for this. We agreed to adopt a mile of Indian River Road from the Norfolk line to the Virginia Beach line for quarterly cleanups as part of Chesapeake's Adopt a Highway program. Our first cleanup will be in conjunction with the Great American Cleanup on Saturday, April 28th, starting at 8:30 am. There was also eagerness to participate in Clean the Bay Day on June 2. One new member reported how her husband routinely goes over to work with Lynnhaven River Now on their cleanups in Virginia Beach, always having wondered why we don't have a similar group in our watershed .... well now we do. Details of where in the our watershed to do the cleanup are still TBD. Some future activities under consideration include doing an Adopt a Garden along Indian River Rd and setting up an information table at the Indian River Craft Show in the fall. We'll send out more information about setting up committees, such as the Outreach Committee next week. Our next meeting will be at a new location - the Oaklette United Methodist Church at 520 Oaklette Drive (right along Indian River Road). They have graciously agreed to let us use the John Teter room the second Thursday of every month from 7:00 to 8:30. Our next meeting is Thursday, April 12th. If you haven't yet taken our online survey, please do. We'll use the results of the survey to prioritize our goals and mission statement. The survey can be found at http://www.surveymonkey.com/s/WS6N56Z . o Advise neighbors on good gardening and yard practices, replacing lawn area with gardens, reducing fertilizer use, benefits of native plants, planting trees, establishing rain gardens, removing invasive plants, developing wildlife habitat, “scoop the poop”, etc. o Adopt a Street(s) for quarterly cleanups, roadside plantings, etc. o Encourage local business to spruce up storefronts and parking lots. o Map park to identify major areas of invasive plant encroachment and important native species, publish trail guide. o Encourage use of trails for biking, hiking, birding, and interaction with nature. o Improve habitat for wildlife such as birds, fish, amphibians, and small mammals. o Engage local business to support group’s activities. o Support activities to enhance streetscapes including safe residential streets, proper tree maintenance, proper ditch maintenance, elimination of illegal dumping and dumpsters. o Support actions to assure any in-fill development follows proper zoning, permitting, and environmental practices. The survey is located at http://www.surveymonkey.com/s/WS6N56Z. The first page re-iterates the opportunities above and then has 8 follow-up questions. Your feedback will be very useful to starting up this organization. Thank you for your time. It was a lively meeting at the Norfolk Highlands Civic League last night. There to answer community questions was a large contingent of the City's civil servants, including Deputy City Manager Dr. Wanda Barnard-Bailey. Key topics discussed were storm water ditches and the Indian River Shopping Center. The Public Works representative admitted that, with 2000 miles of storm water ditches in the city, maintenance crews are almost entirely focused on responding to citizen service calls and there is no routine maintenance schedule in place to pro-actively clear the storm ditches. And with the massive backlog of engineering projects and further budget reductions pending, the probability of improvement did not sound good. The Deputy City Manager did say that the City could come and do an assessment of flooding issues in Norfolk Highlands as a first step in prioritizing issues for the community. For the Indian River Shopping Center, we first heard from the code enforcement group. Based on citizen complaints, they have cited the property with several violations. The property's broker, The Katsias Company, is in contact with the city and has until April 27th to correct the cited issues. The bigger issue of actually getting new tenants into the complex was addressed by the City's Economic Development Director Steven Wright. He reported that the city has approached several grocers and that Katsias is currently in negotiated with a - not named - mid-level grocer for the property; but the grocer is asking for significant improvements. The City is not contributing any monetary incentives. Mr. Wright elaborated that when retailers look at the shopping center, they look heavily at demographics. The retailer’s preference is to put new stores in growing suburbs seeing future construction of more homes and with young families - families with growing shopping lists. That puts built-out neighborhoods like ours at a disadvantage in the race for retailers since we're not seen as a growth area. The challenging question - and one for which Mr. Wright and the other city representatives did not provide an answer - was what can we, the community, do to make our neighborhood more attractive to retailers. That’s something we should all consider and discuss at upcoming meetings of the Friends of Indian River.